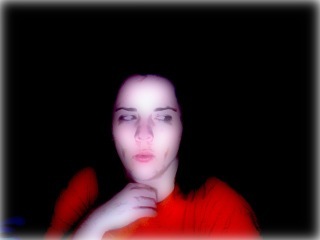 Picture courtesy of Photo Booth. I don't always look that weird but I am that pale. I'm sick. Worse yet is my dad is still in the hospital. Aidan has a class at the zoo today to see the reindeer and it is like 20 degrees out. I wish I could bail but he is excited about it. I gave up my baking ban to make Cowboy Cookies using a recipe I adapted from Laura Bush. They were pretty good but not as good as the coffee shop down the corner. I was too lazy to take pictures. I'm off to see how dad is doing and then take a hot shower to perk up. Hot tea would be great, too. What a challenging time you're facing. I hope you and your father recover very soon. I have that Laura Bush recipe, too, but haven't tried it yet.